Open to dogs of any age and breed, providing they have a good level of pet dog obedience and are comfortable in a group situation. No previous experience necessary. It is also suitable for gundog owners who have knowledge or experience of the sport. Tasks will be set to meet the needs of the participants. Topics will be set to the abilities of the dogs & the needs of the participants. Helen tailors her workshops to suit the attendees & the level of the individual dogs who are working. Topics may include learning the strategies to hunt, teaching retrieve, learning to manage arousal and impulse control, including building connection and focus while training in an outside environment. Foundation behaviours will include heelwork and steadiness. You will also learn all about reinforcement strategies, play, how to teach and use targets, develop the stop whistle and recall. Fun task based workshops with your dog. 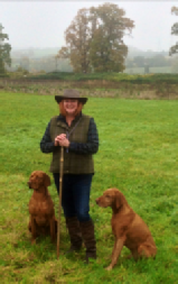 Come for 2 days of amazing information & practical skills to kick start your gundog training. Helen will also be delighted to see our previous attendees & progress their learning further since her last visit.